How to prepare fish casserole easily at Christmas’s Eve? One last little posts before signing off from blog-land until New Year. A bit later than my usual posts, but today is Christmas day and yesterday I was visit my best friend and her kids, you can imagine that things are just a little manic here… I just wanted to wish all of you a wonderful and very happy Christmas. This is easy, fast and cheap recipe. You don’y need expensive food to follow the Xmas traditions. In a large casserole, add your fish. Add fish flavour. Cut baby potatoes, cherry tomatoes and mushroom and add all of them to the casserole. Now add black olive and then season with parsley. Now cover with water and turn on the gas. 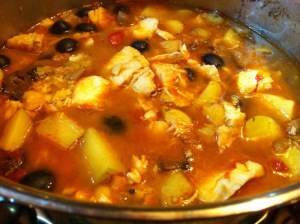 After ten minutes add a stock vegetable to give more season to your fish in casserole. Cook until the potatoes are soft, the fish will cook quickly but don’t worry if it will break. Check the fish and the potatoes and after the liquid is reduced, switch off the gas. Now add oil to season your fish casserole. Serve in a bowl. As side cook your favourite vegetables for example Brussels sprouts. I served them with cranberry sauce. Wishing you all a peaceful, happy, blessed and magical Christmas.